How can you oppose an adversary willing to claim victory at any cost? Still reeling from recent events in the intergalactic cold war, former Earth resident Austin Stone enters a new phase of his career as a Star Runner with the Galactic Legion of Planets by joining the covert squadron known as the "Scorpions." The training is demanding and rigid, pushing him to the limits as he continues to improve his natural skill at the stick of a Trident starfighter. But factions in the Zahl Empire yearning to fan the flames of imperial expansion continue to operate in secrecy, attempting to ignite another fight with the Legion. An immoral and clandestine scheme hatched years ago by Zahlian Agents is entering its final stages, a project with the possibility of shattering the Legion from within. Through vicious encounters and clandestine missions far behind enemy lines, the Scorpions will need all their courage to confront a foe determined to spark a conflict at any cost. With heartbreaking revelations and epic space battles, Star Runners: Scorpions is the fourth entry to the Star Runners Universe, a collection of space adventure books. The characters are just not themselves, especially Nubern. What a shame. Don't like it this way. 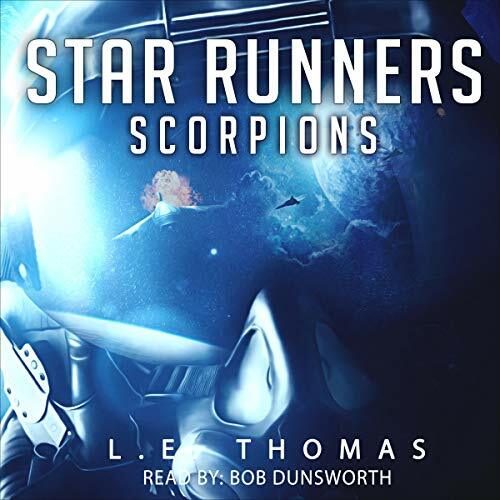 I'm having a hard time listening to the whole book of Star Runners, Scorpions. I've listened to the whole series, and in particular book 1 and 2, the characters and their voices, were set brilliantly Donald R Emero - you identified the characters partly through the voices given to them listening. Listening to Bob Dunsworth is far from this rendering, and it's like watching your favorite sitcom's new seasons, with new actors playing the characters you loved in the previous seasons. Or watching duped movies where the people dubbing are replaced and it just isn't the same anymore. Even if it's better done, you're used to the old way, and in part it's how you identity that role. I'm about 45 minutes in and I don't recognize anything yet - while the same characters are present, they don't feel and sound the same. It's hard to think of this as a continuation of the series I've come to love. I'll give it a bit more time but this book will probably be returned if the narration doesn't improve. So I cannot talk to the story yet - and there's a good chance I won't be able to comment on it if I cannot stand to listen. One of the many issues is that it's the same deep male voice for all characters. One of the great part of the original story was that while the "hero" was male, the universe had lots of different characters, female, strong, weak etc. and the narration made that even more noticable by matching voices to represent that without going overboard. The same voice for all characters makes it hard to keep them apart and keeps the narrator having to say "X said" all the time. Quite frankly, in this case I would rather read the book myself and have my own head make up the voices - at least that would be consistent. The sad part is that I'm reminded of how one of my favorite TV shows in the 80ies were ruined when the dubbing voices were changed. Please Audible and publishers - the voice actor plays a much bigger role than you think when we review the books. Thinking you can just replace them mid series is a big mistake.